When my baby was very young and would cry, alarm bells screamed in my head. Everything in my heart, gut and soul compelled me to DO SOMETHING NOW to fix it. I had no idea this was not just normal—it was a good thing. I now refer to this response in my postpartum doula trainings as the “empathy link”. Many perinatal professionals refer to this as a Secure Attachment Bond. This phrase Empathy Link comes from Rick Riordian, author of the Percy Jackson series. In his writings in Percy Jackson and the Olympian. Grover and Percy share such a link and can thus share images, thoughts and emotions even when quite distant from each other. Parents and babies have been sharing emotions for millennial I think. When my firstborn was just three days old my milk came in and despite having planned for growth, bigger bras were needed. Being in a complete fog (and without benefit of instant delivery by Amazon, as we have now) we trudged over to the local mall where there was a maternity store. 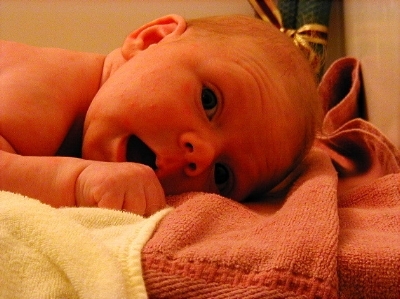 While in the changing room trying to decipher what size I might be today I heard my sweet newborn’s cries. NOTHING could have kept me from running to him and my husband, who was standing over the stroller looking confused. “PICK HIM UP!” The message, via empathy link, screamed through my head. Yep, I was bonded all right. Melinda with her son reinforcing that Empathy Link with touch. As a new mother, my son’s cries caused me great anxiety. I felt everything he felt—those cold wet wipes on his bottom during diaper changes were torturous—horrible! He told me so every time and I felt terrible at the same time that I knew he needed a clean bottom. The cries help us to know what our child needs—attend to the need, get it right and the crying stops, relief through the empathy link. Misread the cue, crying continues and you are compelled to continue to try to fix it, because it is agony to hear your child cry. For those babies who cry quite a bit, it is agonizing and exhausting for parents. Both baby and parent often look wrung out and worn out. This bond, now quite well established, continues to have me feeling pain when my child is in pain. My youngest, unfortunately, has been in a lot of pain for a long time. He has chronic back issues that are sometimes quite debilitating. My heart aches for him and compels me to respond. I have worked hard to find him medical care to address his condition—how could I not? I feel what he feels—not exactly the pain, but the mental anguish and despair of constant pain. I search for solutions for hisrelief, but also for my own. If my child hurts, I hurt. Fortunately, we have at last found a treatment with great promise and we both hold our breath hoping and afraid to hope for relief. As our children grow they shift away from that close bond, but a parent’s heart is still connected. My oldest recently got his driver’s license. Excited by his new freedom, he eagerly went out for his first solo drive. My heart lurched and tore as he drove away. “Be safe!” my empathy link screamed out to him. “Be safe”. Photo credit: Deposit Photos,click for quote link.